The first poem is told from perspective of one of the children as he describes the street where he lives and the trees surrounding his home: “My street is like the trunk of an almond tree/ that blossoms somewhere else./ Who knows if its roots reach down/ into the eastern sky./ Who knows if this house is a nest/ built between trunk and branch./ Who knows if at the tips of its branches/ mysterious fruits are ripening…/ Does anybody know?/ Who knows.” This short and sweet poem emphasizes themes of interconnectedness, as well as the supreme unknown about nature and its complex systems. This element of mystery emphasizes the awe of young children, but also the grandeur of the natural world. The comparison between a street (that is man-made) and an almond tree also shows how we cannot remove ourselves from the natural world, but must learn to live alongside it with respect. Like with many poetry books for children, this book could be used in a lesson on poetry and writing poetry. However, this particular book could also be used with themes of nature, climate change, and eco-friendly habits. As our earth is consistently breaking record-high temperatures, ice caps are melting, and air pollution is affecting the health of people, especially children, it is important to teach our kids eco-friendly habits early on, and to raise awareness about how our everyday actions impact the earth. While this may be a somewhat difficult topic, using interesting and fun activities such as poetry and illustrations could be a way to render it more palpable for young children. Zahedi’s simplistic but beautiful illustrations could also inspire lessons on art, such as illustrations to accompany the students’ poems. 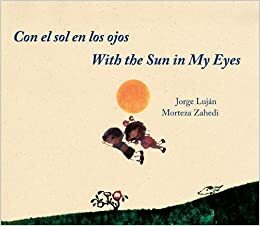 According to a review from Goodreads, “Once again Jorge Luján brings young readers a lyrical and joyful collection of poems. Morteza Zahedi’s powerful illustrations in densely saturated colors perfectly complement the poems’ subtle explorations.” Both the poetry and the illustrations in this lovely collection invite creativity, daydreams, imagination, and self-reflection. This collection is perfect for teachers looking to inspire the creative instinct of their students, while also teaching them about the natural world and the importance of preserving it. Stay tuned for more great reads! Poetry isn’t for me. Don’t have the reading skills to appreciate them. But I find the illustrations to be wonderful.